Lupus is the acronym for Systemic lupus erythematosus. It refers to the condition in which there is chronic inflammation of the joints, skin and other organs. It may also influence other parts of the body. Lupus is genetic in nature. It is found to occur mainly in females. Lupus produces varied symptoms like muscular pain, anemia, rashes, extreme fatigue and much more. Such symptoms may seem more like chronic fatigue and may be missed by your general practitioner. But the condition needs to be diagnosed and treated quickly as it can lead to irreversible damage to the organs. How Are Lupus And Hair Loss Connected? Lupus manifests itself in many forms, one of which is hair fall. It causes inflammation of the skin and the scalp. The inflammation can cause the hair to thin out. The hair loss will generally be in the form of clumps from the scalp. The hair loss can be seen in the body, beard, and eyelashes as well. In most of the cases, the hair grows back when Lupus is treated. But in some cases , the harm is beyond repair. 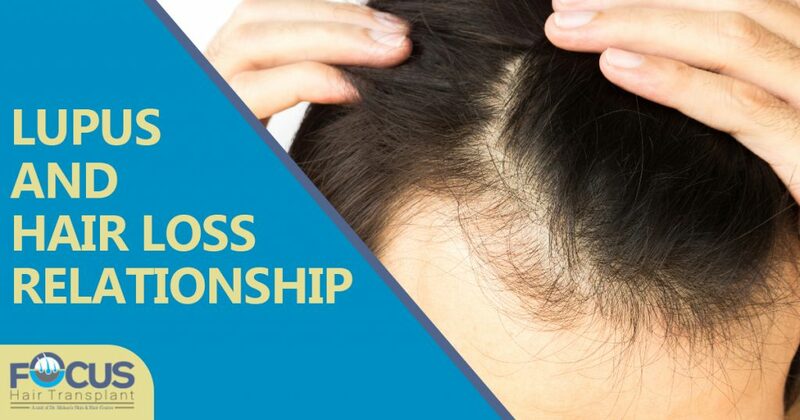 If the person develops discoid lesions on the scalp, it results in scarring and permanent loss of hair follicles, which causes permanent hair loss. Lupus can also cause your hairline to become fragile and cause hair loss in an irregular pattern. This may cause your hairline to become ragged. There is no proper treatment for lupus, the only help you can get is to alleviate the symptoms. This too will be possible only if you start the treatment process early. If the treatment fails to show any improvement, it is best to opt for hair transplant. How Can A Hair Clinic Help In Hair Loss Due To Lupus? We, at NRI hair transplant, excel in providing the individual element as far as treatment of our clients is concerned. We have innovative procedures for hair restoration according to the individual’s cause of hair loss. Our experts will look into the finer details of the problems the client is facing with his or her hair. Subsequently, they will formulate the solution accordingly so that the results guarantee fuller, thicker looking hair. Some clients may require different treatments like FUE hair transplant and advanced trichopigmentation to add more volume to the scanty areas. Every process has to be initiated. The process of treatment will require you to book an appointment for a consultation. Contact us at the earliest so that we can preserve your natural physical resources from diminishing before it is too late.